When Zach (Dylan Minnette) moves with his mother Gale (Amy Ryan) from New York to the sleepy town of Madison, Delaware, he despairs that nothing exciting will ever happen to him again. Things only start to look up when he meets Hannah (Odeya Rush), the friendly and yet mysterious girl next door. However, Hannah’s father (Jack Black) - equally mysterious but much less friendly - tells Zach to stay away. Undeterred, the two teens become friends. So, when Zach hears Hannah’s blood curdling screams one night, he does not hesitate to come to her rescue by breaking into her (rather forbidding) house. What he finds there will unleash horror and chaos on the entire town. Click Here For More Film News And Reviews! Since the introduction of the 12/12A rating classification, entertaining PG-rated movies have been hard to find. Off the top of my head, I can think of only a handful of really good ones (including Big Hero 6, Spirited Away and Song Of The Sea). Let's be honest, the vast majority of under 12-rated family films have been animated snooze-fests. Am I right? Goosebumps, I am pleased (and relieved) to report, is a fun, family film - entertaining for young and (ever so slightly) old alike. I thoroughly enjoyed Goosebumps. It has engaging and likeable leads, a tense and yet funny script and a whole lot of CGI monster fun. 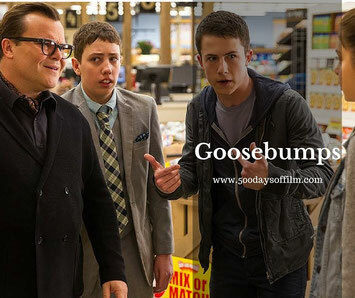 After the initial set-up scenes, Goosebumps moves at a cracking pace. This does mean that some story strands are left undeveloped or unexplained but, on the flip side, there's no time for little ones to get bored. Minnette, Rush and sidekick, Champ (played by the brilliant Ryan Lee), are all great. I liked their characters and, therefore, cared about them. They strike the right balance between the horror and the comedy. I have to admit that I laughed a lot at the brilliant Goosebumps silliness. Meanwhile, Jack Black is perfect in his role as R L Stine. His is a pretty restrained performance. He doesn’t go full on 'Jack Black' here - and it works well. While Goosebumps mainly focuses on chasey, chasey monster scenes, Black grounds the story and gives it heart. Goosebumps features a whole host of fabulous monsters. If you are aware of R L Stine’s books you will, no doubt, be familiar with many of them. For example, there is the yeti from The Abominable Snowman Of Pasadena, the evil gnomes from Revenge Of The Lawn Gnomes, the werewolf from The Werewolf Of Fever Swamp and (creepiest of all - apart from that clown… brrrr) Slappy the ventriloquist (don’t call me a) dummy. I confess that I have not read any Goosebumps books. So each monster was new to me and I really enjoyed meeting them. It was an inspired decision by the filmmakers to bring all of Stine’s creations into one story. Just how scary is Goosebumps? I appreciate that this is one of the key questions a parent might have before taking young kids to see Goosebumps. To be honest, Goosebumps isn’t very scary. The monsters are, for the most part, silly and there isn't any gore, sustained threat or infliction of pain. Think the action and adventure of Scooby Doo rather than The Descent. 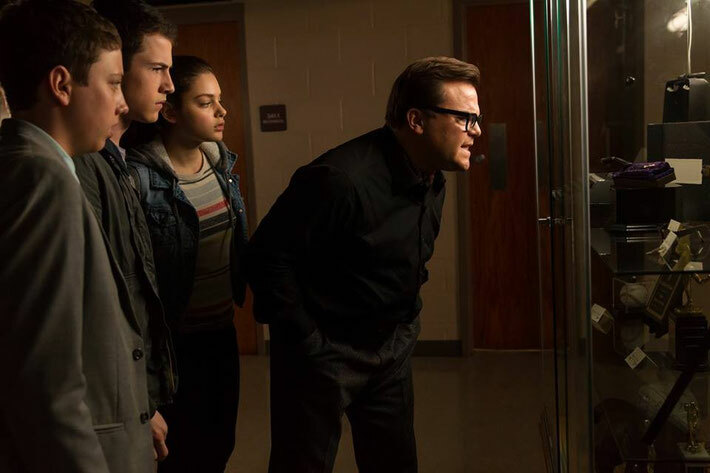 Goosebumps has the feel (and the charm) of a Joe Dante (Gremlins) movie. I'm thinking a toned down version of The Hole. However, there are some minor jump scares and a handful of scenes where the monsters are a little startling and in your face. This could be frightening for a young child - particularly if you are watching the movie in 3D. Whenever I am unsure about a film's suitability, I check out the British Board Of Film Classification (BBFC)’s website for guidance. In the case of Goosebumps, the BBFC warns of “frequent scary scenes”. Click here for the BBFC’s Insight into Goosebumps. Don’t forget that Goosebumps is a PG-rated film and not a U. Where as a U-rated movie is suitable for children aged four and over, a PG-rated film is aimed at children aged eight and over. (Click here for more information on the BBFC’s ratings). Goosebumps may well scare children under seven but you, of course, know your own child best. I just love Ryan Lee - he has superb comic timing. If you enjoyed his performance in Goosebumps, check out Super 8 - one of my favourite monster films. I could have done with more of the comedy police duo - I thought they were really funny. R L Stine is also known as the Stephen King of children’s literature (a reference that leads to a great scene in the movie). He has sold approximately 400 million books worldwide. Have you seen Goosebumps? If you have, what did you think of this film?